Florida Ditches the Comment Card for Visitor Feedback by Opiniator. We were delighted to be featured in a recent article in GovTech on visitor feedback in Florida. GovTech is an online and a hardcopy magazine that covers the use of innovative technology across Government agencies. Specifically, this includes Federal, State, and Municipal agencies. Moreover, the subject categories cover Cybersecurity, through Emerging Technology and Government Experience. Visitor feedback in Florida’s rest areas is no longer from paper comment cards. Instead, they switched to the digital comment card from Opiniator. The index shows a wide gap between the sort of customer experience citizens receive from industry and what they’re getting from the government. Overall, the government scored the lowest among all industries in customer experience with an average score of 68. To emphasize, that’s 14 points behind the banking industry. To put it another way, Washington still dominates the bottom of the customer experience (CX) index. The same report suggests that customer experience can be the galvanizing metric to help Government agencies prioritize services. In addition, customer experience underscores improvements needed to drive better outcomes across all touchpoints. GovTech is very keen to highlight agencies that buck this trend, and over deliver on the customer experience. In light of this, we are pleased they included an article incorporating our work with FDOT, who are now improving the visitor experience at their freeway rest areas. 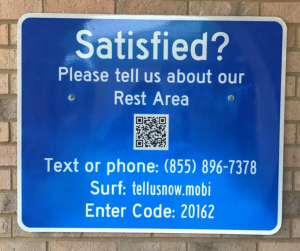 The Department of Transportation in Florida (FDOT) has been using Opiniator for a number of years now throughout the state at all their freeway rest areas. Like many state agencies, they had been using paper-based comment cards at the rest areas. As we have noted before, there are at least twelve reasons why the comment card should be stopped. With this in mind, FDOT recognized that not enough visitor feedback was being generated, and even that feedback was not being acted on timely. Consequently, more visitors were affected by the same issue and satisfaction ratings decreased. Visitors are requested to give feedback via on-site signage. This signage is placed in high traffic areas and shows how the feedback can be delivered using their own cell phone. For instance, they can select SMS, Phone call or the Web. Straightaway, they are asked up to eight questions about their rest area experience. Florida joins eleven other Department of Transportation state agencies incorporating Opiniator within their rest areas. Visitor feedback using Opiniator is in over 450 rest areas. A list of these agencies and the main benefits can be found here. What we are doing is making it easy and convenient for the visitor to give feedback on a device they are familiar with, and an input method they prefer. The full article from GovTech can be found here.